Despite the strong performance of Ubisoft’s story-based series in recent years, with Assassin’s Creed Odyssey and Far Cry 5 leading the charge, it seems that The Division’s story was completed by more players than any of these games. This news comes from The Division 2‘s Creative Director, Julian Gerighty, who was assuring press at a recent preview that the upcoming game’s campaign would prove equally popular to Ubisoft’s original The Division story. Speaking at a recent preview, Gerighty said, “more people completed The Division than any other Ubisoft story game” (via Xbox Achievements). While most players will likely remember trying to survive in the city’s dark zones more fervently, the story was evidently an important part of their experience. If Ubisoft’s The Division story really was this popular, which took about 40-hours to complete, that leaves expectation high for the sequel’s story, which ran into controversy over its “political game” tag last year. 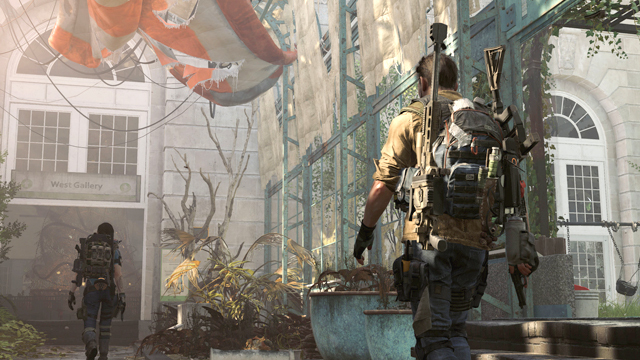 “The Division 2 will have a compelling campaign about saving D.C.,” Gerighty affirmed, “[And] saving the soul of America,” setting up the framework for players to play hero and keep the nation’s capital from falling apart. Given that most players in the original game played solo, nailing down an exciting story is essential for the sequel, so Gerighty’s focus on story isn’t surprising. The Division story is apparently popular enough to warrant a film adaptation, reportedly starring Jake Gyllenhaal and Jessica Chastain and set to bring “stories of love, loss, treachery, and heroism” from the urban apocalypse to the silver screen. We’re likely to see some of the warring factions that rose out of the ashes of the virus outbreak when the film releases, which we most recently saw in The Division 2‘s recent story trailer. The Division 2 is set to release on March 8, 2019, and will be available on PC, PS4, and Xbox One.